Do Dark Mirror Fermions Violate The Pauli Exclusion Principle? We consider that gravitational fields vary – they expand and contract – periodically. At least two entangled – intersected – gravitational fields create in their physical intersection four new fields. We consider that these new fields are the currently known as atomic fundamental particles. We consider that fermions are the fields created by the intersection of two gravitational fields when they vary with the same frequencies and phases. They expand at the same time, and later they contract at the same time, and so on in a cyclical way. When those two entangled gravitational fields vary with opposite phases the created fields (or fundamental particles) are bosons. It is easier to comprehend this simple model looking at a picture. 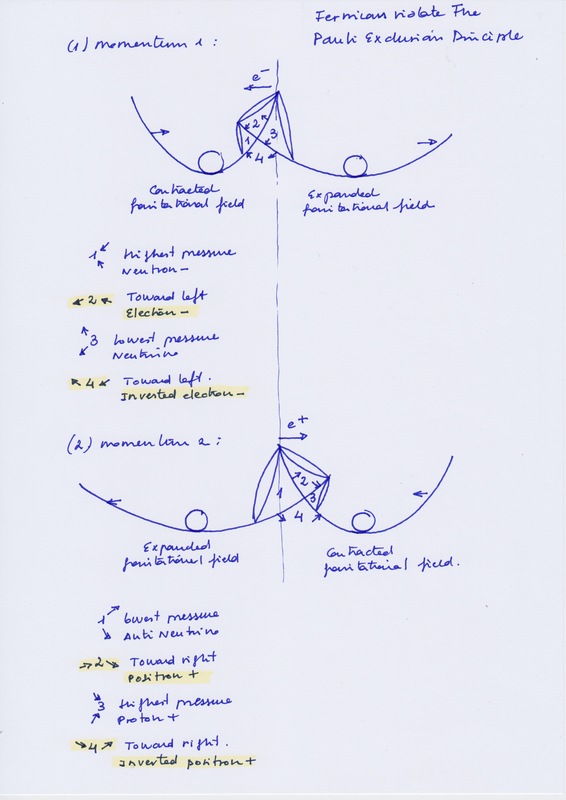 I have drawn 2 different moments of the variation of two entangled gravitational fields that vary with opposite phases. The created fields are, for us, fermions. As you can see below, at momentum 1, the left field is contracted and the right field is expanded. At momentum 2, later, the left field is expanded and the right field is contracted. If you compare the field number 2 at momentum 1 and the field number 2 at momentum 2, yo could see that they are the same field with an opposite location. They are antisymmetric. And they observe The Pauli Exclusion Principle, the field number 2 only can be placed at one side or at the other at a specific time, but it does not exist at the same places at the same time, the field 2 is located in different places at different times. It is evident in the picture that there is no symmetry. The filed 2, represents the negative “electron” when it moves toward the left side at momentum 1; and it represents the positive “positron” when it moves toward the right side. So there is an electrical and asymmetry that fluctuates periodically toward a side and the other. Electrons with negative or positive charge, always move toward the gravitational field that is contracted. Electrons nor positrons are not attracted by a special property of matter. For as “electronegativity” is not any force of attraction, it is the consequence of a spatial variation, the contraction of a gravitational field that is entangled with other that (at this moment) is expanded. The spin inside field 2, the kinetic movement created by the gravitational variations and its forces of pressure, is opposite at momentum 1 – when it comes to an electron – and at momentum 2 – when it comes to a positron. On the other hand, the field number 4 is antisymmetric with respect field number 2. They have an inverted symmetry. Its antisymmetry is different from the antisymmetry that we commented before from field 2 at momentum 1 and at momentum 2. Field 1 and field 4 exist at the same time. They experience the same forces of pressure, and they have the same direction – although they are inverted as you can see in the picture – in their spins. (We consider that when current science is measuring the of masses of subparticles the are really measuring the forces of pressure that experience those fields. In this sense, it could be said that field 1 and field 4 have the “same mass”). Although the field 4 looks smaller that the field 2, it appears that field 2 and field 4 violate the Pauly Exclusion Principle at momentums 1 and 2. If we consider field 2 at momentum 1 as an electron, and field 2 at momentum 2 as a positron, and we consider they are the same antiparticle – a Majorana antiparticle because the same field is its own antiparticle at different times – how must we consider field 4 with respect to field 2 at momentums 1 and 2? We could say that field 4 at momentum 1 is the inverted antimatter of the electron-field-2 at momentum 1. And field 4 at momentum 2 is the inverted antimatter of positron-field-2 at momentum 2. Could we consider these inverted antimatters – the field 4 at momentum 1 and 2 – as dark matters? are they a dark electron at momentum 1 and a dark positron at momentum two? We think yes. If we are trying to observe the field 4 from the concave side of the entangled gravitational fields, it will a dark matter for us. Field number 4 is placed outside the gravitational fields, in the convex side of their intersections. Electrons and positrons are placed at the concave side of the entangled gravitational fields. So we consider that when it comes to fermions (when the entangled gravitational fields vary with oposite or different phase) there is an inverted mirror symmetry between field 2 – electrons (and positrons) – and field 4 – dark electrons (and dark positrons) – that represents a violation of the Pauli Exclusion Principle. We consider that fermionic electrons and its dark counterpart electrons exist at the same time like mirror inverted dimensions. And later, in a different time, fermionic positrons and ints dark positron counterparticle exist at the same time as inverted dimensions too. So, fermionic electrons and positrons are their own Majorana antiparticle that exists, periodically, in different times (a positron is the same electron that moves toward the right side, and an electron is the same positron moving at the left side). They respect the Pauly exclusion principle because they can not exist at opposites places at the same time. But fermionic electrons are the Dirac antiparticle of dark inverted electrons, they exist are mirror inverted antiparticles at the same time. And positrons are Dirac antiparticles of dark inverted positrons, they exist as mirror inverted antiparticles. So, dark mirror electrons, and dark mirror positrons violate periodically the Pauli Exclusion Principle at different times. For us, fermionic mirror dark matter violates the Pauli Exclusion Principle. But we think that electrons and positrons are not “elemental particles”, speaking in the current term it could be said that hey are formed by quarks. This is not currently accepted. But it is a clear deduction from the model that I have put in the picture above, I consider as a “quark” each arrow that I have drown there. So, in our opinion, fermionic electrons are formed (from right to left) by an up quark and a down quark. And positrons are formed (from left to right) by an up quark and a down quark. The dark inverted electrons are formed (from right to left) by a down dark quark and an up dark quark. And dark mirror positrons are formed (from left to right) by a down dark quark and an up dark quark. A down quark (of the electron) and an up dark quark of the dark mirror electron create a neutron. And a down quark (of the positron) and an dark up quark (of the dark mirror positron) create a neutron. In the case of bosons electrons and positrons are formed (from down to top) by a down quark and a top quark. But I will speak about this issue and about interaction between particles, in other post.